Inder Loves Folk Art: Birthday dresses. Today was my niece Helen's third birthday party. Can't believe she's already three! She used to seem like such a baby in comparison to Joe. Now they seem practically the same age. Crazy how that happens. A fun time was had by all. I took the opportunity to take a few photos of Helen in her birthday dress. The fit couldn't be more perfect (except that Helen is so insanely tall for a three year old that I really could have added some additional length to the size 4). And the colorful fabric looks fantastic with Helen's red curls! I just love this pattern! I want to sew a million Geraniums! Those cap sleeves are perfect for keeping the sun off fair skinned shoulders. 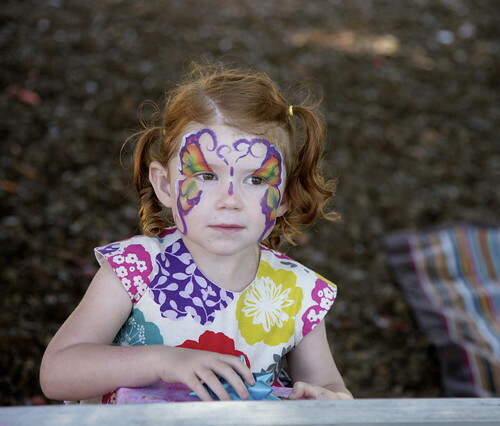 It even coordinated perfectly with her "rainbow butterfly" face painting. She looks like a pensive fairy child here. Happy birthday Helen! It's going to be a big year for you. You're about to move into a great new house, and you'll be getting a little brother or sister (and I'll be getting a new niece or nephew to sew for!) this autumn. We are all so excited for your family! It seemed fitting to dress Maggie in the dress I made for Helen's first birthday: the "Pretty as a Picture" dress from Anna Maria Horner's Handmade Beginnings book. I was so excited to see it in the boxes of hand-me-downs we got from Helen. Dresses aren't very practical for Maggie, because they get in the way of crawling. And climbing stuff. And being the crazy monkey child that she is. (As I recall, this was an issue for Helen at age one, too.) So I decided to shorten it into a tunic top. I still love these fabrics, even if that panel does make me think of that Portlandia skit - "put a bird on it!" This dress was so easy to put together, and I love the folksy vibe of the wrapped bodice and "apron" skirt. It has a little elastic in the back to cinch it in, and the fit is super cute. I recently gave this book away, feeling like I've made what I'm going to make from it, and I've outgrown these simple patterns. But this dress reminds me that "beginner" patterns are often fantastic. It is so fun to put something on Maggie that I made for Helen two years ago, and to still love it. Can't believe this little girl is almost one! Smoochy smoochy. i know i say this every time, but the cuteness is unbearable!! i was literally oooing as i saw maggie in that darling dress, now tunic! :) it's such a cute pattern, isn't it? you're right- the portlandia skit kinda ruined birds for me too. but on this top, they're perfect! That dress suits Helen perfectly! It really does go great with her red hair (and the face paint of course)! And isn't getting handmade goods back the best? I made a bunch of things for my sister's kids before I had my own and every time she gave me hand-me-downs there were some of my handmade items in the mix. It was so nice to see them again (and to know that she appreciated them enough to keep them!). Oh, and Maggie! I just can't get enough of that little cutie! 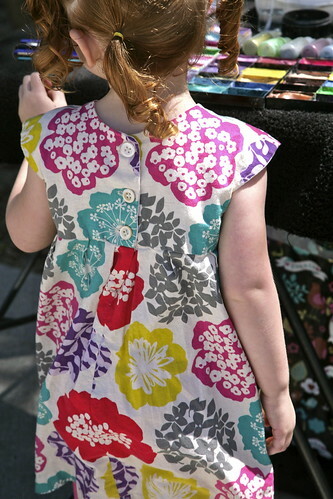 Oh yes you chose the perfect pattern and fabric for Helen! 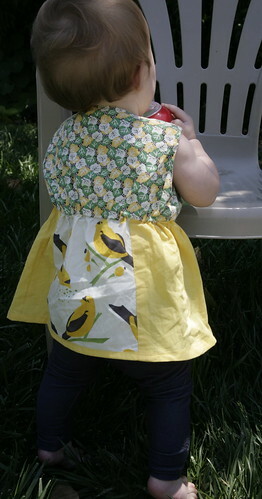 And you're right, sometimes the really simple patterns can be the best - love that hand-me-down on Maggie. Maybe she will be in the Geranium some day! The dress looks so beautiful with Helen's coloring! 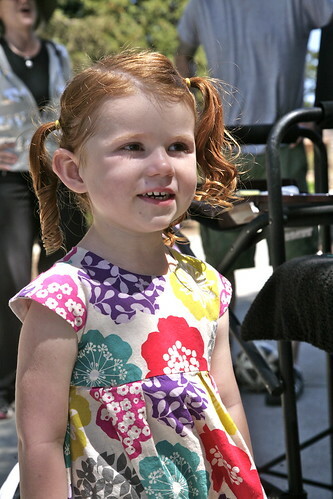 And Maggie's tunic is adorable too. Oh she is so cute Inder! I wish international postage was not so insanely expensive or I would send you a box of had-me-downs too! 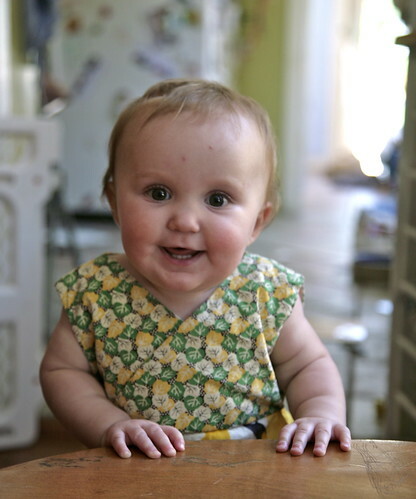 Clearly there is a superabundance of cuteness in your family.